The Leland CO2 TapGas® brand assures you that the cylinder is clean, rust and debris free and that the CO2 is of the highest purity. We have been providing beverage gases for over 52 years. The Leland CO2 TapGas® brand assures you that the cylinder has the right thread and the cleanest interior. 6 premium cartridges per package. Ships by ground. 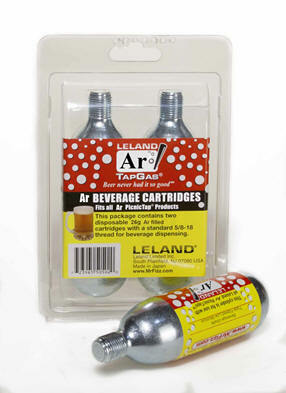 The Leland CO2 TapGas® brand assures you that the cylinder has the right NON threaded end and the cleanest interior. Guaranteed to fit your device. 12 premium cartridges per package. Ships by ground. The Leland CO2 TapGas® brand assures you that the cylinder has the right NON threaded end and the cleanest interior. Guaranteed to fit your device. 50 premium cartridges per package. Ships by ground. Leland's premium regulators all take the 5/8" threaded neck cylinders. That goes for our famous CO2 Picnictap® as well as the FridgeTap®, FlexHoseTap® and the CO2Conversion Kits for kegerators. 2 premium cartridges per package. Ships by ground. The Leland N2 TapGas® brand assures you that the cylinder has the right thread and the cleanest interior. Leland's premium regulators all take the 5/8" threaded neck cylinders. That goes for our famous N2 Picnictap® as well as the FlexHoseTap® for Nitro tapping coffee and wine preservation. The Leland Ar TapGas­­® brand assures you that the cylinder has the right thread and the cleanest interior. Leland's premium regulators all take the 5/8" threaded neck cylinders. That goes for our famous Ar Picnictap® as well as the FlexHoseTap® for Keg Wines, tapping coffee and wine preservation devices. The Leland®, CO2Tapgas®, CO2 PicnicTap®, CO2 FridgeTap® and CO2 FlexHoseTap® are registered trademarks of Leland Limited, Inc. South Plainfield, NJ 07080 USA.